This app reads and writes Markdown documents that contain Swift code. The code can be executed too! You can run individual code blocks, or all the blocks in a file. We're using this app to update our book Advanced Swift, and while writing blog posts. We find it very useful, and we hope you do too. 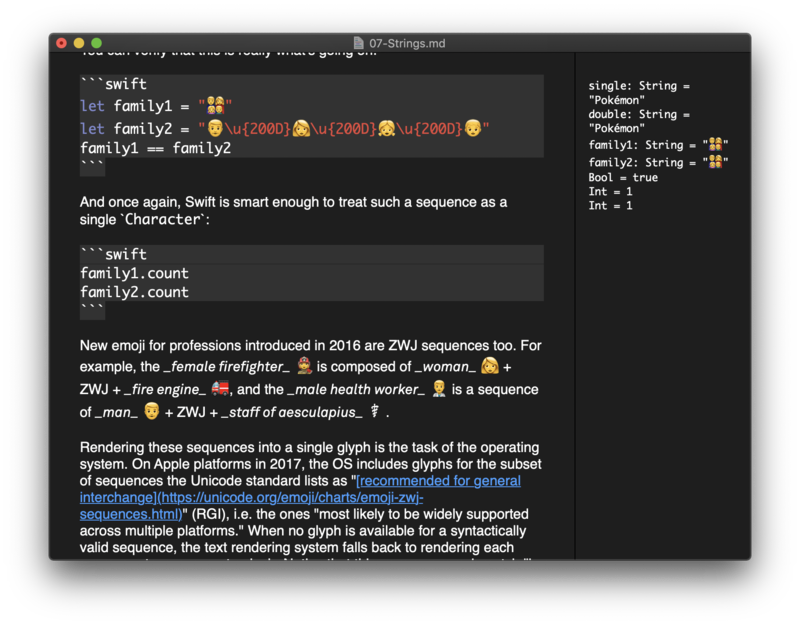 The app works by sending Swift code to a REPL instance, then reading back the results. Compared to Swift Playgrounds or Xcode's playgrounds, this is quite limiting, but it also means we can keep things simple. We're documenting the building of this app on Swift Talk, a weekly video series of conversational live-coding hosted by Chris Eidhof and Florian Kugler. The first episode previews the app, and is free to watch. You need to have cmark installed from master (not via homebrew). If you use the version from homebrew, you won't get proper syntax highlighting (specifically: for inline elements). This project uses Swift Package Manager. You can either run "swift build" or do "swift package generate-xcodeproj"
This project could head in a number of directions, and there are many useful features we could add. Our main goal is to keep using this for authoring Swift-heavy Markdown, which will guide our decisions when we decide on new features. To keep things simple, we have collected a list of todos in todo.txt.